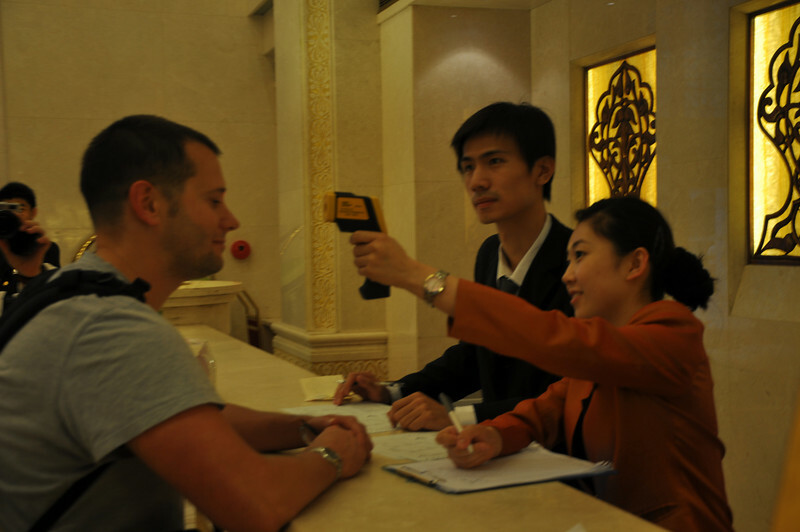 The Xinjiang Hotel's policy, in light of the H1N1 "epidemic" (plus a dose or three of paranoia) was to take everyone's temperature at check-in and check-out (and often in between). Thankfully, they've eschewed oral or rectal thermometers and opted for some sort of infra-red gun aimed at your forehead, which Matt is enduring here. On the other hand, evaporating sweat on the brow seems to give these things poor readings, since I invariably came out a good 1.5-2° C (~3° F) below normal body temperature...!